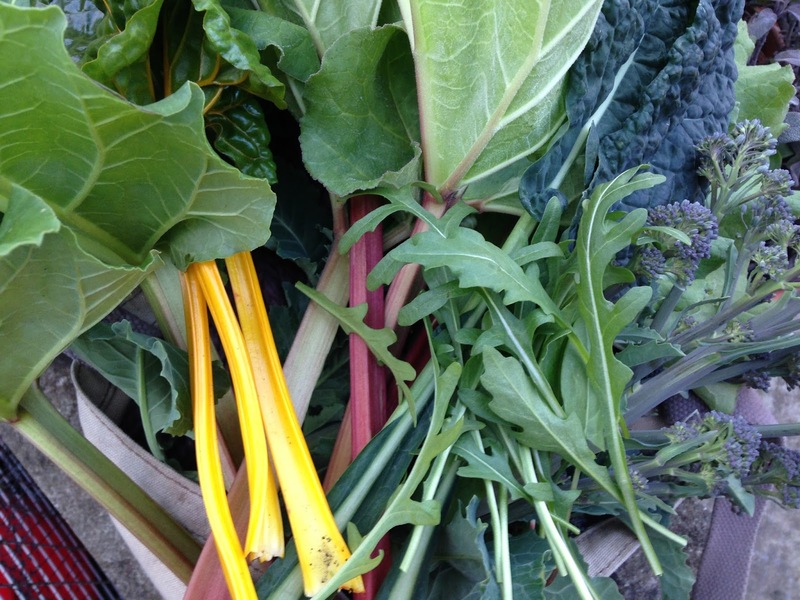 There were a number of PSB stalks ready for cutting (luckily I had a pocket knife in my garden bag) to which I quickly added some yellow chard, Cavalo Nero kale, pink stems of Red Champagne rhubarb, plus a few salad leaves of wild rocket, sorrel, baby chard and baby beetroot. And, just like that, I had the makings of a nice supper. I just added some Camargue and Wild Rice to the cooked veg, and some stem ginger and yogurt to the rhubarb. My first (almost) all veg patch supper* of the year. 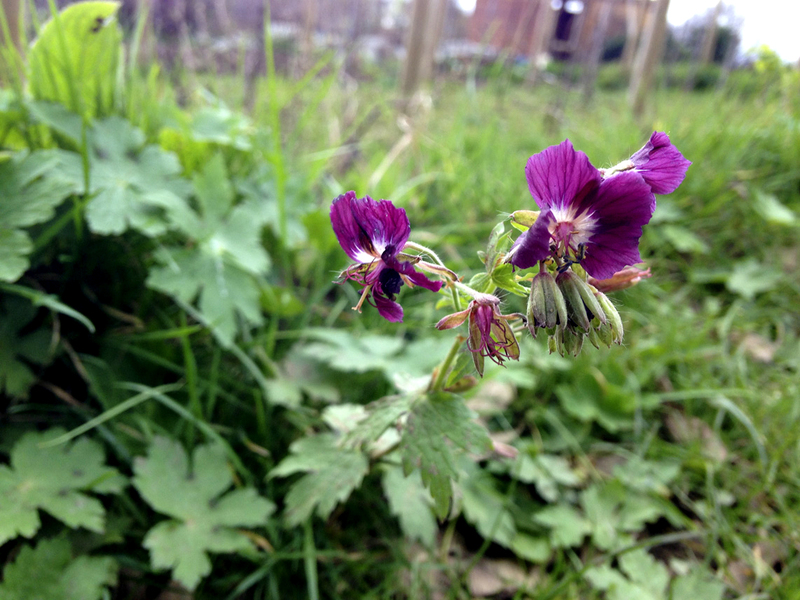 Can I just say what good value the wild rocket has been this winter? I eat salad with everything, even breakfast if I'm having eggs, and these leaves have stood over winter as a really good cut and come again crop. * Leaves of chard and kale were finely sliced and stir fried in olive oil with shallots, garlic, chilli and grated ginger; the stems were steamed with the broccoli stalks while the rice cooked. I usually add a dressing of tamari soy sauce to spice things up a bit as well. The rhubarb stems were roasted for a short time in the oven then mixed with chopped stem ginger and plonked on top of yogurt. I'm no chef but I like tasty fresh food! 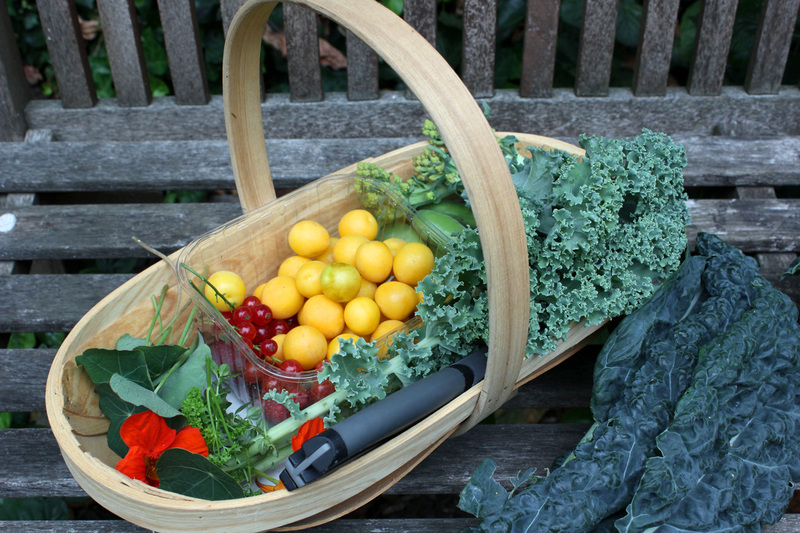 A shared allotment can be a complicated business if y'all do your own thing. This seemed to be the arrangement when I was asked to jump in and help Doreen, a local octagenarian, keep her allotment plot last autumn. I was offered a large 5ft by 20ft overgrown bed to maintain while three other helpers kept up the rest of the plot. The others had a baby (now there are two) so plot visits were infrequent, if not impossible, whereas Doreen and I would regularly pop up, drink tea and hatch plans before pottering off to dig (in my case) or visit plot friends (in hers). 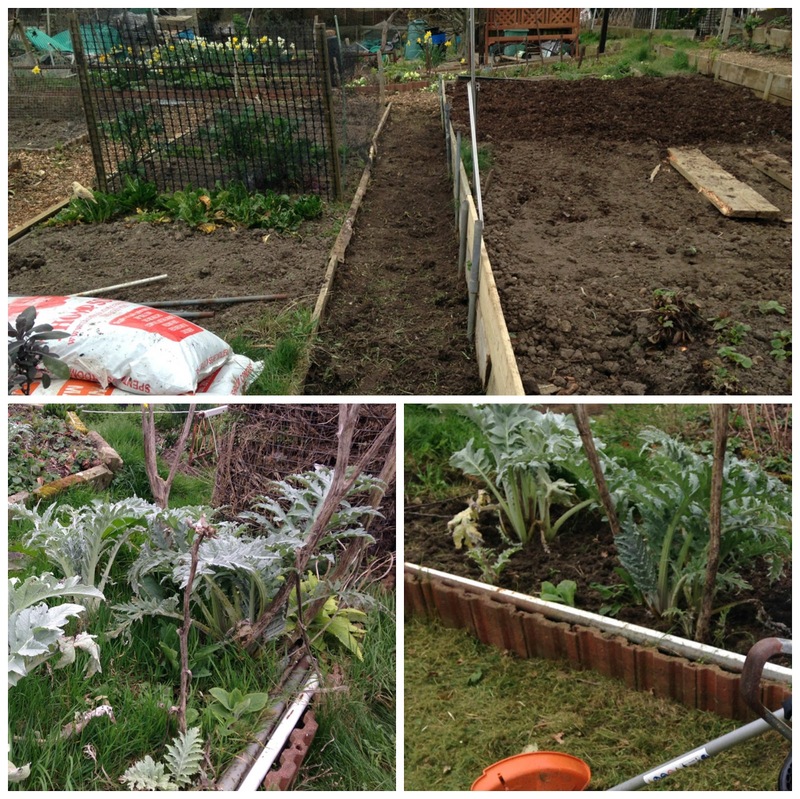 We rarely saw the other helpers and their beds remained untouched through the winter, to the point that weeds built up, veg was ignored - except by me, hah! - and bean wigwams (with old pods) were left standing. 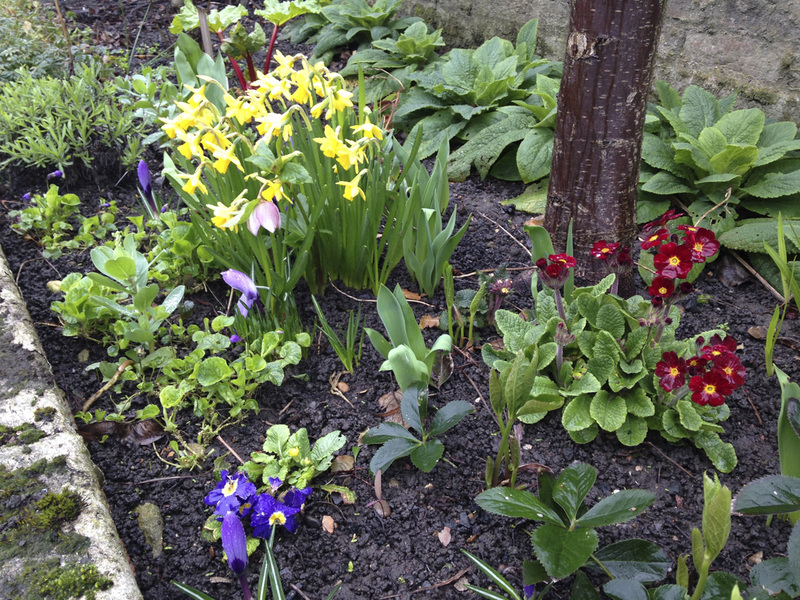 It was a frustrating vision, particularly as Doreen (the 80 year old) and I like a nice tidy plot. But it was hands off - for now - as the others had, in fairness, managed the plot for the past few years when Doreen couldn't. Fast forward to early March and a pleasant surprise awaited. In the days since my last visit, the bean wigwams had been dismantled and the beds hoed. Apparently the others had sprung into action! Then I had a message to say that mulch had been ordered and did I need anything? No, but it did make me think. Wouldn't it be nicer if we managed the plot together rather than individually? I pictured a plot filled with three lots of the same veg and little room for anything else. Bonkers. I decided to resolve the situation. Last weekend, we met up and agreed very amicably to work as a team. Hoorah! Now we could start to plan properly. The first thing was to make the plot child safe for the toddlers. Rusting metal poles used for holding fencing in place had to go, as did sharp edged metal cages used as cloches. Rotting bed edges were remade with new wood. Nettle patches have been removed. The huge pile of raw edged chicken wire, tangled netting and fencing stakes have been neatly stashed out of the way and a broken cold frame has been dumped. The others brought a friend along on Sunday afternoon to dig up a grass path between the beds ready for mulching with bark chips while we tidied, cleared, weeded, raked, mulched and chatted. It was windy and a bit chilly but so so good to be busy working together. I do love a bit of community action - we achieved so much in just a few hours! And once the plot was empty and tidy, I felt motivated to stay on after the others had left and strim the long grass. Working together as team, when it works, is fantastic - each plays to their own strengths and everyone goes home with the rewarding feeling of having got things done without being too knackered! On a practical level, compromise may be needed. We won't always be working alongside each other as I can get to the plot more easily than the others so the work won't be evenly shared, but I accept that. I'll be going little and often while the others can pick up the slack at the weekends. 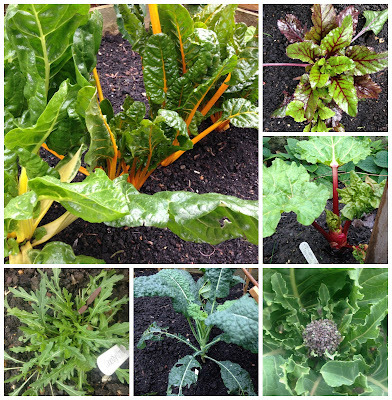 Expectations have to be realistic but as long as there's also good communication, a little diplomacy and a lot of enjoyment, it looks like being a fun year ahead - I just hope there will be enough veg to go round in the summer! I do like to chat so a bonus to taking the rubbish to my car meant that I got to meet other allotmenteers as I went back and forth. (I like to recycle rubbish where I can.) On my walk, I noticed that Geranium phaeum was in bloom and growing massively on one of the plots so I asked if I could help myself to a bit. Within minutes the gardener had cheerfully dug up a large clump for me, saying it grows wild on the plots, and accepted a pile of sturdy metal grids in exchange. Allotment life at its best! Never mind yellow - Spring is also full of pink. Although I'm not sure that tulip should be in bud in mid-March. Sometimes (actually, with increasing regularity) I despair at the culture we live in, where statistical results and budget take precedence over common sense and communication. This past week I've seen tree works carried out by undertrained and badly equipped contractors acting on the orders of disinterested landlords and I've also had a conversation with a lad on our estate who is struggling to keep going with his chosen career of horticulture. In both instances, I believe budget played a part. My alarm bells starting ringing a couple of months back about the tree works when notices were posted about which trees would be affected. We're in a conservation area so permission has to be sought from the local council for any tree works - yes, even when I want to prune my fruit trees in spring apparently! 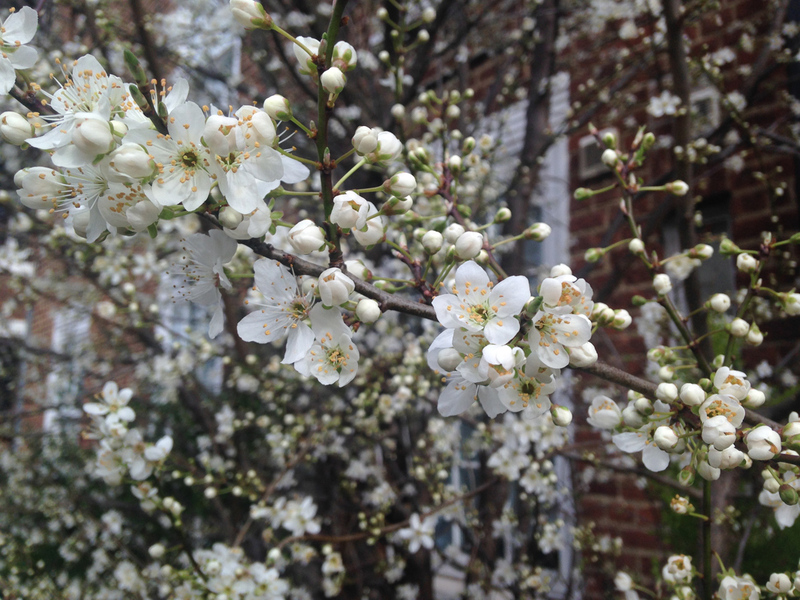 I checked the online planning application and map and was satisfied that my fruit trees were unaffected by this cull but, stupidly, missed the threat to the cherry plum tree growing next to our playground area. It's too late now, of course, but I'm wondering why on earth anyone would want to destroy a healthy, prolific and beautiful fruit tree. It was small, as trees go, the perfect urban tree - covered in bridal confetti blossom during late February and March and hundreds of sweet yellow plums in July. The problem here is that there is no programme for regularly maintaining the trees and shrubs on the estate - the budget conscious powers-that-be ignore the situation until it becomes a problem. The tree was allowed to grow unchecked until it reached the first floor and the lower branches stretched out across the pathway next to the border. Pruning the lower branches back would have resolved any hazard to pedestrians and left tenants with a beautiful tree and delicious fruit to eat. But, no. 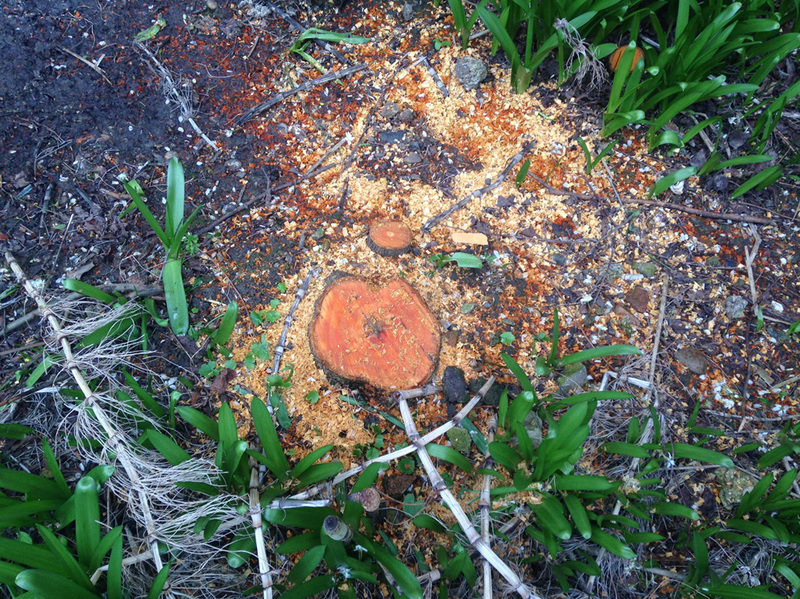 What we have now is less than a stump. It was the only tree marked out to be 'felled and poisoned', despite there being several over-tall conifers blocking the light to flats on the second floor. Even the contractors were perplexed at the loss of this beautiful tree. It might seem overly sensitive to some but I have felt truly saddened by this all week. The contractors were careful of my newly raked soil when pruning out the epicormic stems of the limes in the middle garden. 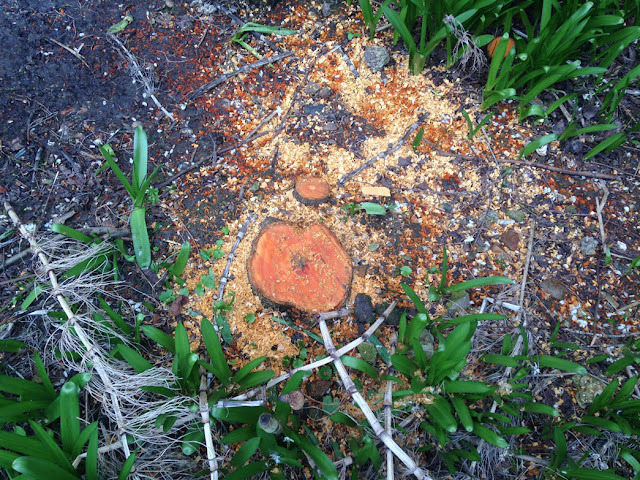 (In fact, even there these stems weren't pruned correctly, being chopped off half way.) By some miracle the ivy on the limes, currently housing several nesting birds, was left alone. The council planning department had deferred to a member of the local Conservation Area Committee to verify that they had no objections to the tree works requested and the woman consulted (not a tenant here) actually asked for the ivy on the lime trees to be pulled off!!! Words fail me!! (I know I dislike ivy when it's spreading on the ground, but ... my little birds!!) AND, it's absolutely no business of hers if I, as caretaker of the garden, am happy for ivy to grow up the trees as it has done for years. Flippin' cheek! *Takes a deep breath and calms down* There was a silver lining to this cloud as I asked the lads what would happen to the wood chippings of their morning's work and was told that I could have them. So it seems that a decision has been made as to what to line the circle of the middle garden with. Not grass, fake or real, nor gravel but bark chippings. PS. 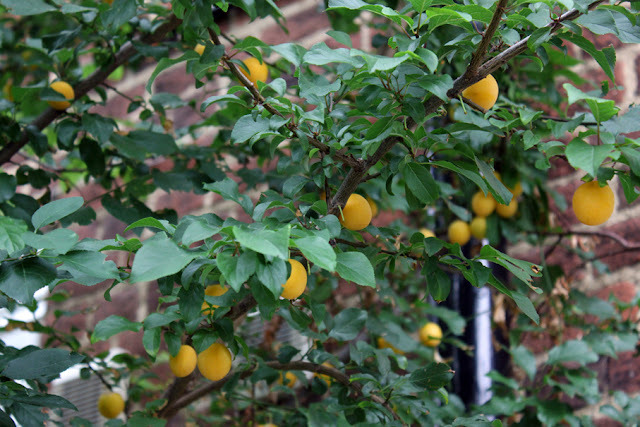 I've just discovered that Thompson and Morgan sell cherry plum trees as bare root hedging plants ... and I was considering replacing the Euonymus hedge in the middle garden. Maybe another problem solved? PPS. Please forgive my ranting. I sometimes forget how much I learned during my garden design training which included a lot of horticulture and focus on plants. I certainly wouldn't expect everyone to know a Viburnum from a Cotoneaster but would have thought that someone practising arboriculture would be trained to know the difference! Now depleted winter veg but, ooh look!, here comes rhubarb and psb! Wild garlic (ransoms), Tarragon, Chives. The gaps will be filled with parsley, coriander and dill and fennel also grows in the garden. 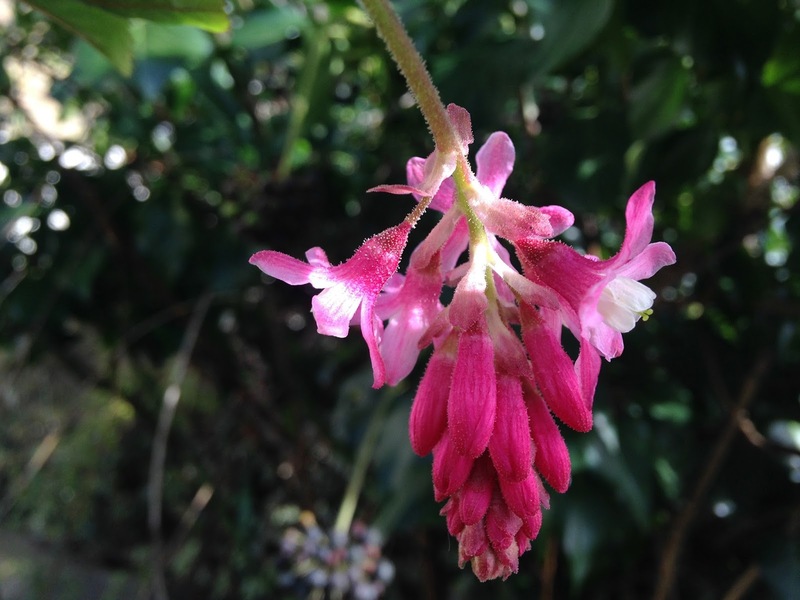 Seeing the garden spring back into life over the past few weeks has brought good cheer and a reason to walk through every day, sometimes lingering to pull a weed or two and making plans. It's not just veg that's grown here though and my favourite spot right now is the patch under the apple tree - I like to think of it as my "spring border. 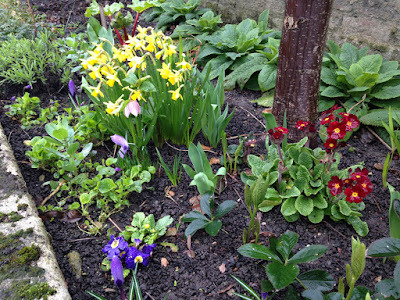 As soon as the fruit trees were planted, I wanted to pretty up the soil underneath so every year since I've randomly dropped in primulas, mini daffodils, violets, snowdrops and crocuses - all of which are gradually spreading out and providing much needed sustenance for early pollinators. Last year I transplanted some of the hellebore seedlings from the middle garden and am delighted to see that they've started to flower this spring. The more the merrier! I'd like to claim that I actually planned the planter above but the sad reality is that I ran out of time in autumn 2015 and plonked crocus bulbs in so that they weren't wasted ... and since last spring had completely forgotten they were there, proving the point that bulbs thrive on neglect. Most gardeners have their fails but, happily, I seem to have turned this one around. 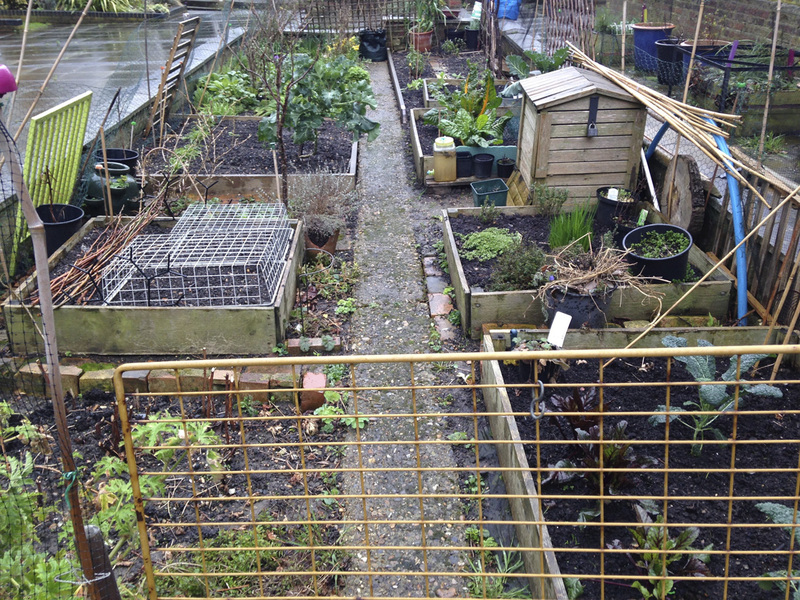 Inside the veg patch, the raspberry canes have been cut down, empty beds are weed free and mulched where possible - hence the cages over the asparagus bed. Purple sprouting broccoli is finally starting to sprout to my huge relief. A couple of the plants had got so enormous that they regularly toppled over, blocking the path or crushing other plants depending which way the wind blew. These plants were 'Early summer purple' so wouldn't have sprouted until May; that was bad planning on my part as I now need the bed for other veg so, spur of the moment, I heaved them out. Yep. That was probably a really stupid decision in terms of future harvests but, lesson learned, I should have known by now to place them at the back of the bed, firm them in and tie them up. The supporting stakes were not strong enough for such big plants. And at least I can now get to the far end of the Veg Patch. Every year a learning curve. I'm really happy with the veg patch at the moment, although there's still work to be done. I still have a little bit of hungry gap veg and, more importantly, I have space to get the ball rolling again - and, serendipitously, a bit of free time coming up to do just that. 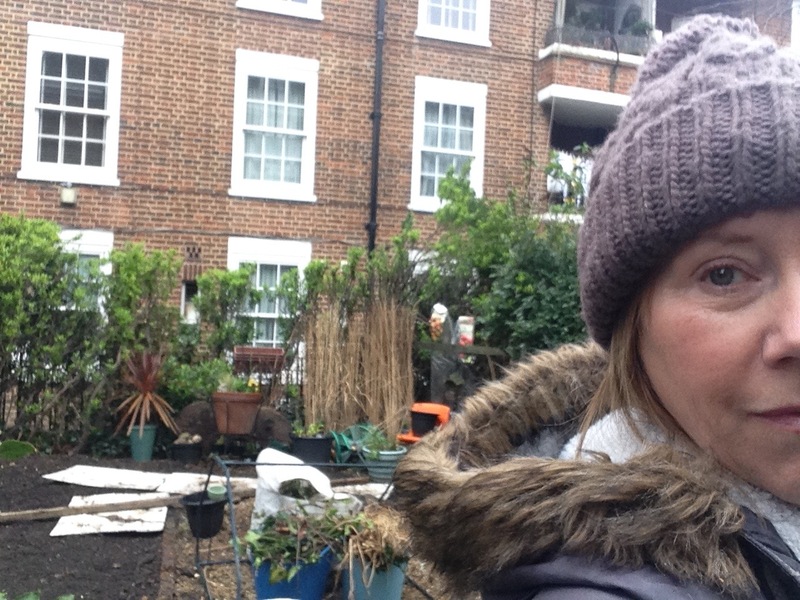 I've read that #mygardenrightnow will be back in June, joining the Chelsea Fringe online. Look out for news about that nearer the time from Veg Plotting. There's a garden bloggers meme running - for this weekend only! 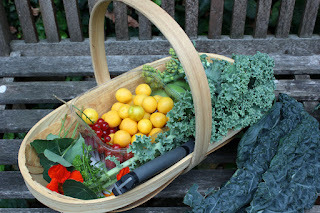 - hosted by Michelle at Veg Plotting blog. 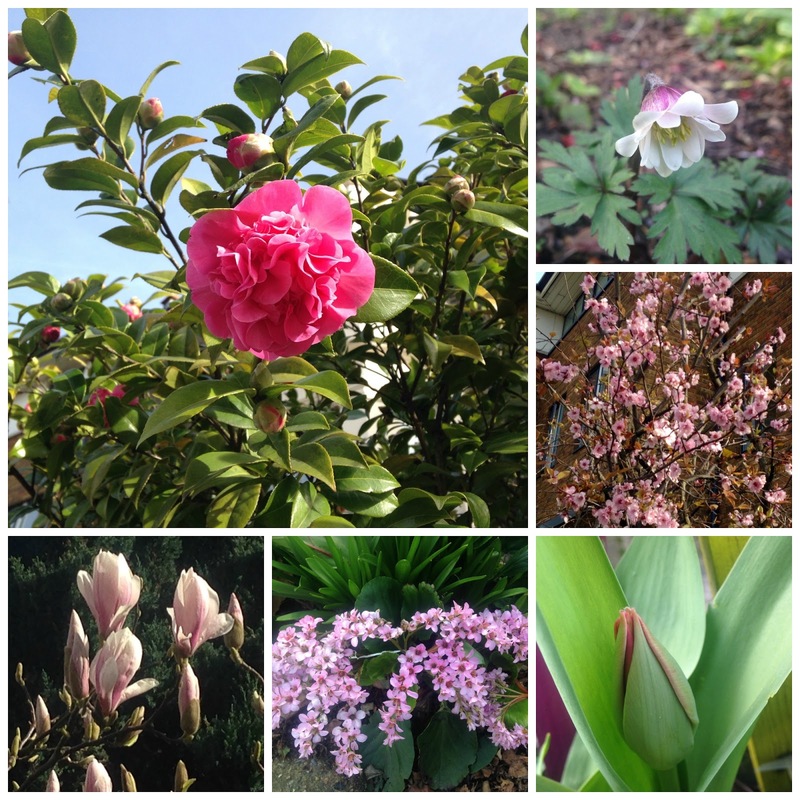 Come join us and check out what other garden bloggers are up to this weekend! 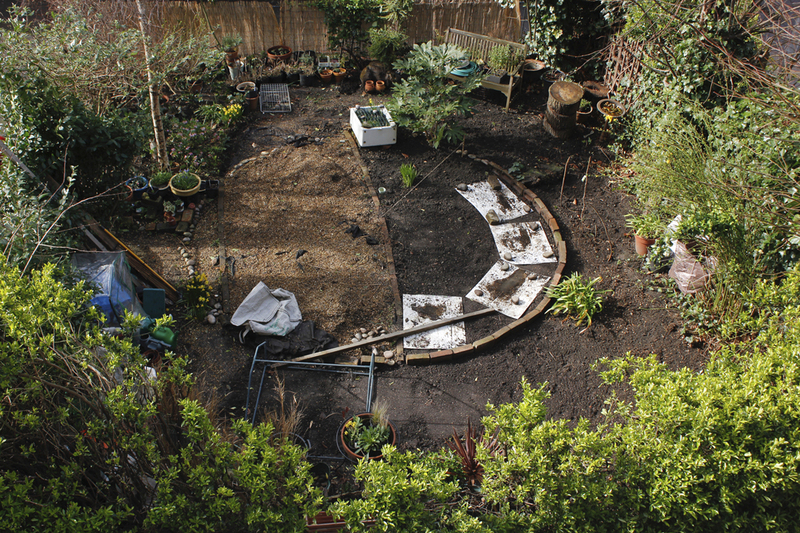 It might not look like much but progress was made in the middle garden yesterday. This is the little garden which I look out on from two floors up and which I started to clear last year. 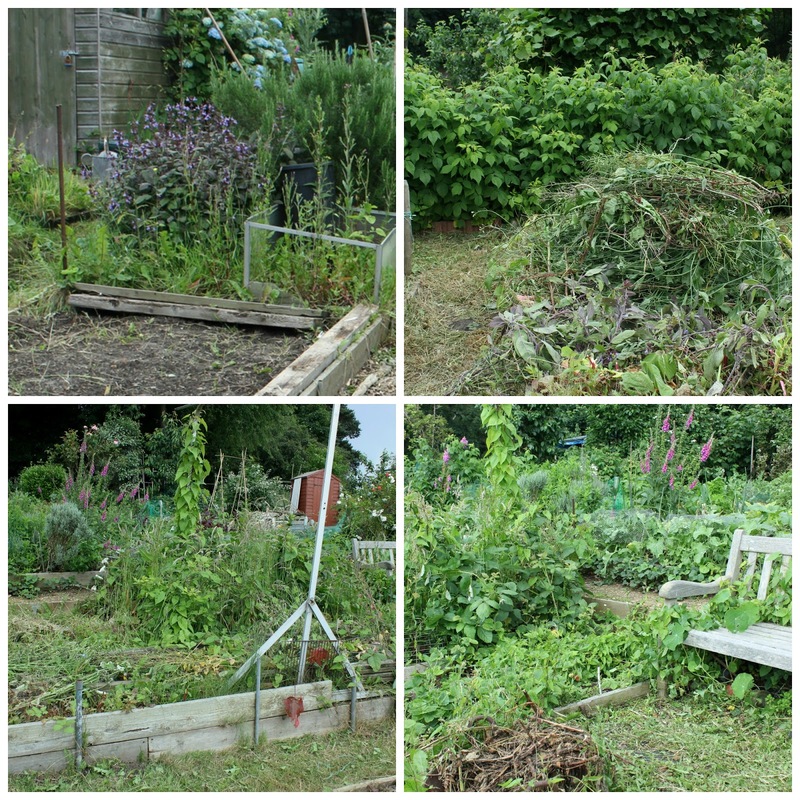 I've been taking my time as there was a lot of ivy and other stuff that needed to be got rid of (mostly on the occasional day off work) but, finally, I'm redoing the layout. As with all garden design, it was important to get this step completed first before I could introduce new plants but over the last year, I've acquired lots of plants for this space - some bought, some given, some adopted from my mother's garden. 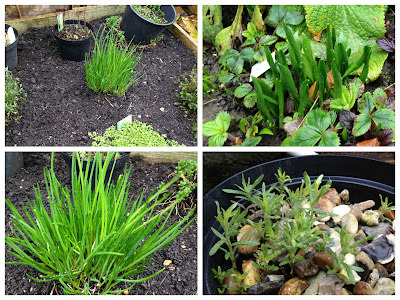 These plants have been shuffled around the garden in their pots while I deal with one area or another but timing is now crucial. Spring is here and these plants need to be in the ground, so the layout has to be finished. Yesterday's task was to level off the soil where I'd dug out weeds, bricks and tree roots, hack back some more ivy and clear under the Euonymus (spindle) hedge ready to chop it back more. All done by 6pm, just as the light was fast fading. 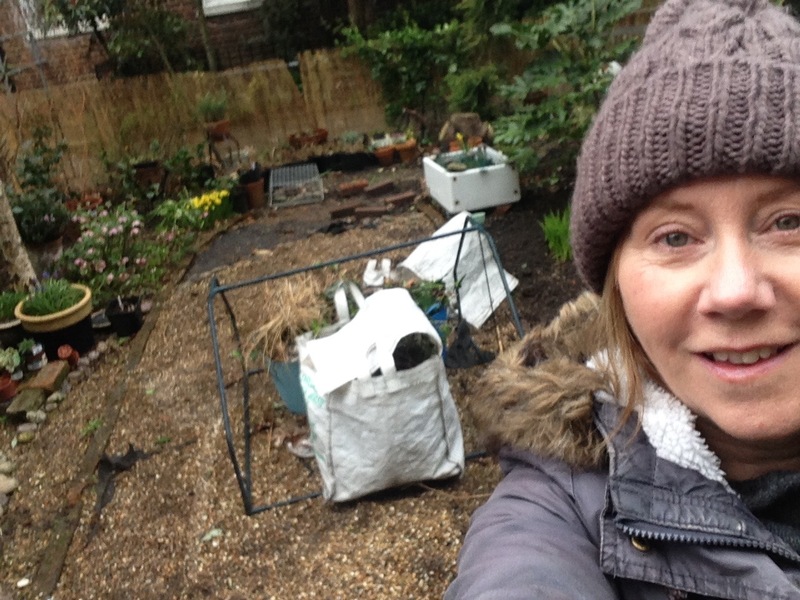 Luckily, when I got in, I spotted Michelle's weekend meme #mygardenrightnow; photos were needed so, at 8 am this morning, before taking my garden waste to recycling in the rain, I snapped a (rare) quick pic of me in the garden. 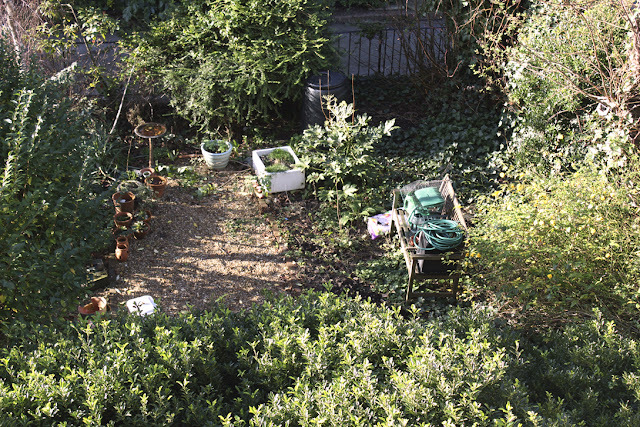 13 months ago - 7ft wide hedges and ivy creeping up to the tiny weed filled oval of gravel. I'm still deciding whether to keep gravel in the centre or replace with grass or chippings.